The Way to College: Is South Korea Ripe for Educational Reform? Seen as the main source of social mobility, education is a highly charged issue in South Korea. As an advocate for educational reform, Hyunjung Kang argues the need to tackle inequality and stress, as students compete to get to the best colleges. Perhaps in most other countries the leakage of exam test papers at Seoul’s Sookmyung Girls’ High School in July 2018 would not have gained national media attention. In South Korea corruption and competition in education is a hotly debated issue. Particularly following the Chung Yoora scandal, in which the daughter of a close confidante of former President Park Geun-hye bribed her way into an elite college – the outrage of which contributed to the Park government’s downfall. It emerged how twin girls at the private high school in Gangnam who had previously achieved average test marks, managed to leap-frog their peers and become the best ranked students in a matter of months. Suspicion soon fell on their father, who worked as a teacher at the school. Evidence pointed to the fact that he purposefully leaked the test papers to his daughters. The two students were subsequently expelled, and the father sent for prosecution. But beyond the keen sense of injustice and anger that many Koreans feel towards this incident is the clear premium placed on academic achievement and the crucial importance of exam results for college entrance admissions. South Korea is a highly educated society. In 2018, the college enrollment rate reached 69.7 percent. Prevailing public opinion is that college entrance admission determines not only the college, but also the prospects for employment, income, as well as the creation of personal networks. It is seen as the main source of social mobility as the brightest futures are reserved for those students with the best results, who then go on to the best colleges. However, a recent poll indicated that 70 percent of Korean students (Korean language source) do not trust public education. Compounding with the concerns of fairness and transparency, is the perceived gap between the high school curriculum and the requirements of the demanding College Scholastic Ability Test (CSAT), which determines student grades. As a result, many students have resorted to afterschool tutoring in so-called “cramming schools”, where they study until late at night. Studying hours for Korean students are the longest among OECD countries. According to the OECD’s Student Well-Being Report 2017, 23 percent of Korean students said they spent more than 60 hours per week studying in and out of school, nearly double the OECD average of 13 percent. Families with children regularly spend about 30 percent (Korean language source) of their average monthly income on private tutoring. This is a considerable financial burden, to the advantage of those families who are able to afford the extra tuition. The pressure to succeed comes at a high financial as well as psychological cost. Moreover, South Korea’s suicide rate is not only the highest among OECD countries, but recent data by Statistics Korea also shows that suicide is the leading cause of death (Korean language source) among young people aged 9 to 24. In his inaugural address in May 2017, President Moon Jae-in acknowledged the need for educational reform to allow “equal opportunity, a fair process and righteous result.” Consequently, the government has announced a number of policies. Following the Sookmyung scandal, the government declared that it would take measures to prevent teachers and their children from working at, and attending, the same school. The government has also banned late night classes in “cramming schools” and plans to ban weekend classes. While these steps are welcome, parents with sufficient economic means are still able to choose to employ private home tutors. Importantly, in August 2018, the Ministry of Education announced the revision of the long-criticized college admissions system, emphasizing the adoption of a more student-centered approach, built upon “simplicity and fairness”. With students’ admission to college being overly determined by the results of the CSAT entrance examination – the detractors of which arguably induce excessive competition and stress – the ministry has sought to incorporate alternative admission criteria into the selection process. These include student essays based on the French baccalaureate system, extra-curricular activities, academic awards, volunteer work, recommendation letters, transcripts, and the high school GPA. Not everyone is convinced by the recent reforms, with some arguing that it is still possible for student records and personal statements to be manipulated. 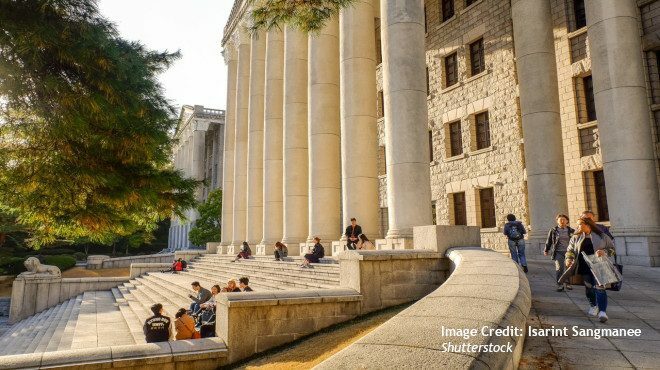 Nevertheless, it could represent a positive – and potentially fairer – first step in reforming the admission system in South Korea. In sum, the road to college in South Korea has become a burdensome rite of passage, which has pushed society into a mental and emotional panic. Levelling the playing field in education by resolving issues of corruption, stress, and inequality will not be an easy task and there is no simple solution. Yet it is everyone’s wish for greater transparency and fairness in the entrance admission system in order to “normalize” public education, reduce private education costs, and ultimately, to better look after the welfare of students. Hyunjung Kang is a guest researcher at ISDP. She is a freelance educator in educational technology.